In the last quarter of 2014, VMware rebranded, their Cloud Management products with vRealize names. 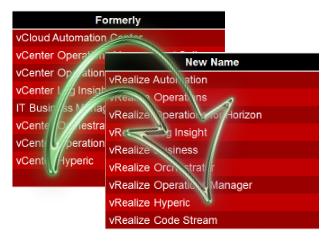 VMware vRealize Rebranding is complete now. Several customers asked me since then were some products have gone/are named. So after many requests I compared the products and compiled a table with product names how they are formerly known and how their vRealize name is now. I hope this helps a bit to find the correct product and how its called nowadays. VMware vRealize Automation drives business agility by automating the delivery of personalized IT services. 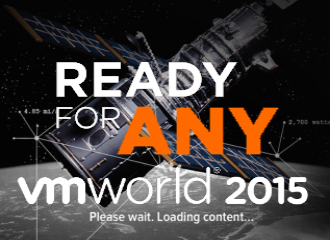 VMware vRealize Operations for Horizon allows you to easily troubleshoot, manage and monitor your end-user computing environment with a single pane of glass that extends from your data center through to your devices. VMware vRealize Business provides transparency and control over the costs and quality of IT services enabling the CIO to align IT with the business and to accelerate IT transformation. VMware vRealize Code Stream provides release automation and continuous delivery to enable frequent, reliable software releases, while reducing operational risks. VMware vRealize Orchestrator simplifies the automation of complex IT tasks and integrates with VMware vCloud Suite components to adapt and extend service delivery and operational management, effectively working with existing infrastructure, tools and processes. VMware vRealize Hyperic is a component of VMware vRealize Operations. It monitors operating systems, middleware and applications running in physical, virtual and cloud environments.